One of the most noticeable effects of stress in one's life is the changes in his performance. While we can easily recognize the consequences of normal or excessive amounts of stress through mere observation, it's best to learn about the scientific relationship between stress and performance. 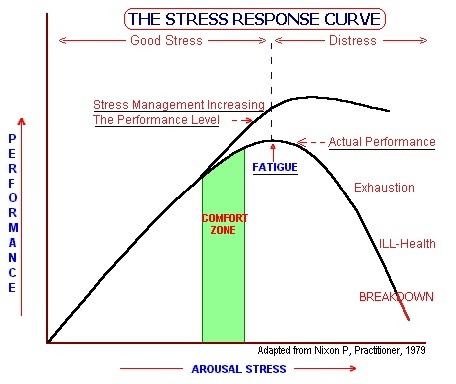 To better understand the effects of stress to performance, Nixon, P. (1979) created the following graph of the stress performance curve explaining how stress affects performance in theoretical terms. The curve shows that as the level of stress increases, the performance level also increases, to the point of eustress, or healthy tension. Near the point of fatigue, an identified area called the Comfort Zone indicates the range of stress levels that we can absolutely manage and facilitates good performance levels. As stress begins to be perceived as overwhelming or excessive, the person reaches a fatigue point wherein the performance levels starts to decline. The ultimate end of overwhelming stress, called burnout, can be exhaustion, ill-health or breakdown. With getting ready for UPSC each student who is going to appear for exam is sure to experience stress and anxiety. This is not distinctive to this explicit examination and is experienced by all aspirants. the primary time a student experiences this can be throughout the tenth standard board examination once undue pressure is exerted on the student from friends and family, as if this is the examination that may outline the course of his life. Primarily, stress and anxiety don't seem to be bad in moderation. Stress throughout the UPSC preparation method is due to numerous factors. 1. Most of the aspirants commit to cover each resource that's accessible within the market (visit bookshops, photocopy outlets, on-line portals and collect all accessible resources). Once the materials bring together, they produce stress and anxiety). Solution: The answer is, rather than taking everyone's suggestion and making an attempt to review everything below the sun, gain an intensive data regarding the program initial of all so one NCERT book should be focussed on and a further book is used as reference. It's vital to be content with restricted material and specialise in understanding instead of superficially reading several books or referring to totally different materials. 2. Lack of correct planning& time management make aspirants feel exhausted. Aspirants have a standard story that finding out 12-14 hours on a daily basis would facilitate them prepare well. In truth, this can be random schedule, that solely creates stress and makes the preparation method even slower and littered. Solution: A correct planning is must throughout the preparation method. a plan should embody short term, term and long run targets. And rather creating the preparation quantitative, aspirants ought to rather create it qualitative; which suggests rather than finding out for 10-12 hours in an exceedingly day with fully exhausted mind, rather study for five to six hours with complete focus and devotion. 3. In order to urge a footing over the competitors, rather than focusing on their own strategy and level of preparation, aspirants attempt to imitate others blindly. during this method, they fail to grasp their own strengths and weaknesses. (At times, a subject or a matter mentioned by a friend we don t seem to be attentive to produce stress and anxiety. we have a tendency to fail to grasp that nobody is aware of everything). Solution: Aspirants need to perceive that everybody has his own potential, mental capacity, totally different perspective and own approach of grabbing or understanding the items. Therefore rather than following others strategy, aspirants ought to analyse their own weaknesses and strengths; and supported that they ought to follow their own strategy observing their comfort and capability. 4. As a result of many myths regarding Civil Services Examination, most of the aspirants believe that they need to sacrifice their social life and study day & night throughout the preparation for Civil Services examination. As a result, they find yourself confined themselves to a space for long duration to review which is the major reason for stress. Solution: Students should perceive that they regetting ready to become officers who will need to serve their country and its folks. Therefore, having sound data regarding what's happening around,however folks are talking regarding the happenings, however satisfied or disgruntled they re, what quite modification they re observing in our society is equally vital for associate aspirant. Aspirants mustnt solely specialise in enhancing educational data however ought to develop the proper temperament traits, that are necessity to productive get through all 3 stages of examination. So, now and then it s vital for aspirants to travel outdoors, play a sport they like or discuss this events with others to understand others perspective associated to suppose like an administrator. This helps clear aspirant's mind whereas reducing anxiety and stress.